Mehrdad Khan Moayedi serves as Chairman of MKM®. 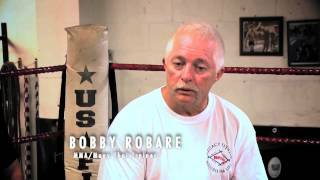 He brings over 40 years of Martial Arts and Muay Thai experience to the fight organization, as well as over twenty five years of business management expertise, fight promotion, ringside commentating, fighter managements, and executive TV producer. From the age of four, his family knew he would one day become an avid athlete as he was already quite competitive and developing his own training regimens to make himself superior. As he got older, he built his own sand bag and wrapped his hands to work the heavy bag. As an adult, his training became more intensive and included weights, plyametrics, Ancient Persian Meels, and kettle bells. Much of today’s modern training styles include training methods he used many years ago as he was growing up. As a child, Mehrdad Moayedi admired legendary icons such as Mohammad Ali and Bruce Lee, as well as the historical icon King Cyrus The Great. They represented everything he wanted to become and they became the root of which he grew upon. These icons inspired him to train as a warrior and venture into the most traditional forms of training to learn various disciplines in the Martial Arts. Growing up he played soccer daily, trained in boxing, Persian Wrestling/Zhurkhanah (House of Power), and later started intense traditional Martial Arts training and also learned Kushti Kaj (Iranian Martial Arts). As an adult, he traveled the world and gained tremendous knowledge in multiple Martial Art styles under the teachings of Far Eastern Grandmasters and some European Muay Thai Kickboxing teachers. He also learned deep meditation skills, Power Yoga, Chi Kung, and then ultimately became a disciple of Grandmaster In Suk Pak in Toronto, Canada where he earned his 6th Dan Black Belt in the style of Kong Shin Bup – Hap Ki-Do and Tae Keuk Do and became a Certified Master under the World Kong Shin Bup Association. Master Mehrdad also trained under Grandmaster Hwang In Shik in Canada in early 1989 to 1991. Grandmaster Hwang In Shik was featured in a number of films such as “The Young Master” with Jackie Chan and “Return of the Dragon” with Bruce Lee. Master Mehrdad had the privilege of exploring and learning the Art of Ki Kong internal energy from Grandmaster Hwang In Shik, which taught him how to be relaxed in order to execute the most explosive power with any striking maneuver. He also had the opportunity to learn Grandmaster Hwang In Shik’s version of Hap Ki-Do, which was very different from other Korean Martial Art styles. 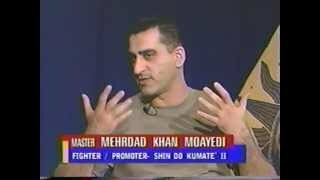 In December 1991, Master Mehrdad moved to the U.S. and used his vast knowledge of the Martial Arts to develop his own unique style and named it The Art of Shin Do Kumaté. He combined the best of Hap Ki-Do, Kung-Fu, Tae Keuk Do, Muay Thai, Western Boxing and Persian Kushti Kaj/Wrestling (a highly effective Grappling style). He began teaching his system in the U.S. and in 1995 formed a competitive amateur league called Master Mehrdad’s Muay Thai Classic™. In 2002, he formed a professional fight promotion bearing his initials “MKM® Knockout Promotions” and began producing Shin Do Kumaté® professional fighting events for Global television distribution. 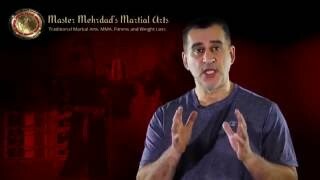 Master Mehrdad was the first person to introduce and teach Muay Thai in the Tampa Bay area, the first to introduce amateur Muay Thai competition in Florida, and the first fight promoter ever to be licensed in the State of Florida to produce professional Muay Thai fights. Master Mehrdad Khan Moayedi and TBAE Network meet up to create a show that will focus on kids Traditional Martial Arts episodes. It will cover honor, tradition, respect, anti-bullying, confidence, and benefits of Martial Arts training. The children’s Martial Arts TV show is going to be available on Brighhouse channel 635, and Verizon FiOs.